Having admitted the problem, it becomes easier to come up with a plan of attack ... especially if you have smart friends who care enough to make suggestions in your Facebook feed (as mine did last Friday) which pulled me out of my death spiral. 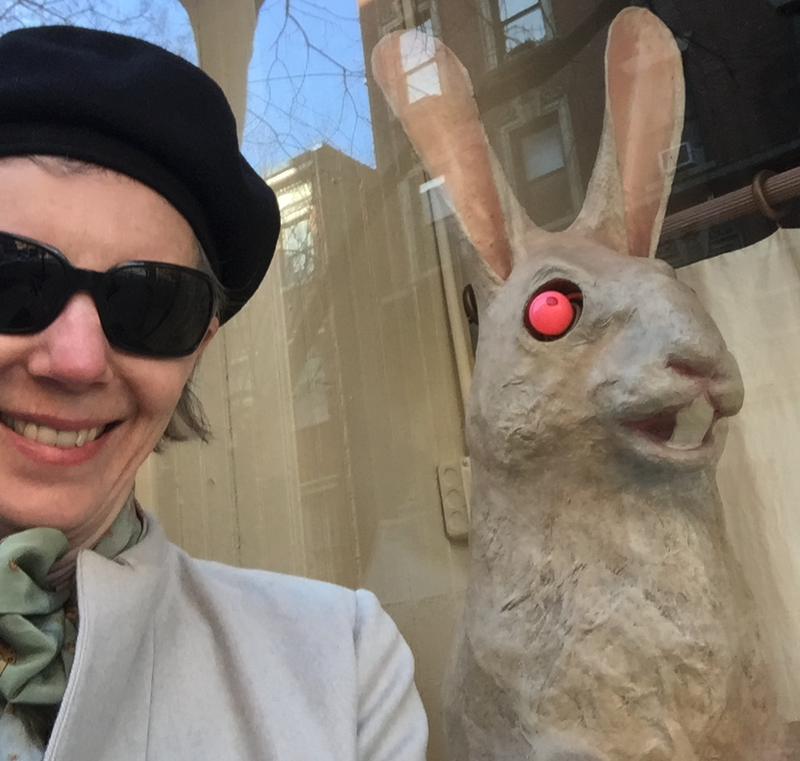 With the one exception of wishing that I hadn’t sought ‘fun’ in walking past the weirdest storefront window in the Village (with the large rabbit, on Waverly near Charles) I recommend following their suggestions to a ’t’. I’d gotten sucked into the old perfectionism trap and was trying to come up with seven, beautifully constructed, tightly written pages to drop into the middle of the script. Having gotten out and 'moved my body', I relaxed ... and had an idea! Do what art students do at museums: copy from the masters. And so I googled ‘best eps of 30 rock”, watched the 30 Rock episode called ’best-structured” (acc to Vulture: 1. “Tracy Does Conan” Season 1, Episode 7), understood for maybe the first time EVER what people are talking about when they talk about ‘structure’, watched it again and wrote down what happened scene by scene and a third time to see how long each scene ran, watched some I Love Lucy and did the same thing. I’m probably not going to win any speed race in finishing this rewrite but at least I’m working on it and even having fun with it which is a huge improvement from the panicky death spiral during which the fingers were clenched around the pen, the shoulders brushing the ears and sounds of anguish coming out of the sides of the mouth. Thank you my dear friends for your love, support and ace suggestions!